This project Interfaces an IPod Infra Red remote control to the discovery board. The Maxell IR remote control show below was picked up from the local 99p store as it seemed a good candidate for micro-controller interfacing, Similar ones can also be found cheaply at the moment on ebay. 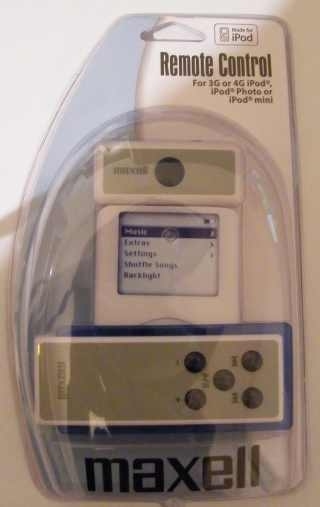 A quick search on Google picked up this site http://stud3.tuwien.ac.at/~e0026607/ipod_remote/ipod_ap_new.html which documents the original IPod remote protocol and confirmed my expectations that this unit would be good for micro controller projects. From the work done at the website we find that the receiver unit communicates with a standard serial comms protocol and is powered from a standard 3.3v supply and so can be connected directly to one of the STM32F100 usart's. The IPod Remote receiver units operates at 19200 baud , 8 data bits, 1 stop bit and no parity and can be directly connected to the STM32-Discovery board. So the plan is to use Usart1 for the IPod's remote receiver input and Usart2 to display the pressed key on a Ansi terminal program, But first lets look at the hardware.